Being outside and photographing gives me focus (pun intended). Going anywhere without a camera, usually means, missing something wonderful. Sharing my passion with students at Canadore College for courses I've developed as well as taking part in a number of Craft Markets in the Parry Sound area regularly during the summer has led to many new experiences. People hanging work in their homes and offices is very humbling. The interaction and multiple facets of photographing people in their many environments, trying to make photographs that will be treasured for years to come has become my passion. 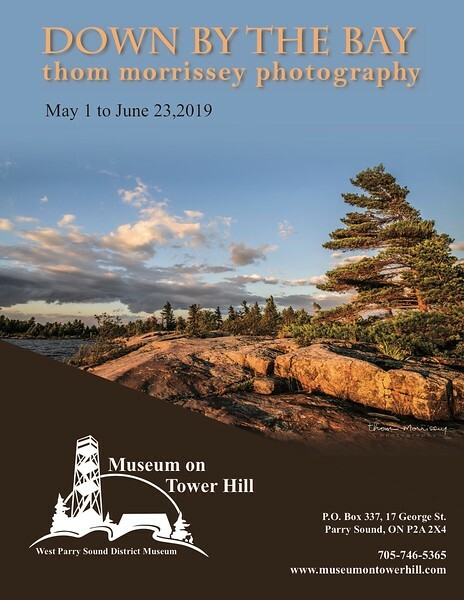 Please contact me at thommorrisseyphoto@gmail.com or by phone at 705 746 4722 if you have any questions about my Georgian Bay prints and canvases, portrait or wedding work. Looking forward to hearing from you! Kevin Barks (Principal) at Bayshore Financial is really happy with his triptech - 3 panel, 18x36 inch canvas entitled 'Peace and Quiet' taken near Britt, Ontario. Kevin will be enjoying it for many years to come. I will be available at the Parry Sound Market on Tuesdays during the summer as well as the Rosseau Market along with a number of other markets at various times. I continue to be out shooting, gathering images that convey the beauty around us. I can be reached through my website or by phone if you have any special requests or would like to discuss an order. I am still printing and matting my own work from 8x10 to 18x24 and have added a variety of new products including canvas, metal and acrylic! Dividing into sections various photos have taken on new life!